Your client just revealed that she’s having suicidal thoughts...what do you do? Does she have a gun? Has she written letters? Picked a location? Have hope something will change and doesn’t want to hurt family and friends? Asking your client, “where do you hurt?” often reveals the focus of the suicidal intent or the purpose of self-harm behaviors. As a clinician, it’s important to remember that even though you view suicide and self-harm behaviors as dysfunctional and maladaptive, your client views them as purpose-driven means of eliminating or managing unbearable levels of pain. For your client, these behaviors are beneficial, attractive, and helpful. Even the most seasoned therapists struggle to develop an empathic view of their client’s devastating methods of managing emotional pain. Learning how to help clients discover the sources of their pain and providing them with healthy options for solving and managing these struggles in their lives is the key to hope. Join Jack and learn how to help your clients confront the darkness of suicide and self-harm behaviors. DVD recording with electronic manual and instructions. Implement a risk assessment strategy that helps clinicians determine which clients present the highest risk for suicide and self-harm. Analyze the concept of suicide “contracts” and communicate their impacts on clients, clinicians, and clinical vigilance. Explain how intent differentiates self-mutilation from suicide attempts and accurately identify the one form of self-mutilation that is a warning sign for potential suicide completion. Implement techniques for effectively intervening in crisis situations and develop a strategy for determining when and how to hospitalize clients. Articulate the role of addictions in the suicidal and self-mutilating population and employ a multi-faceted therapeutic approach that ensures client safety and addresses treatment of the addiction. Determine the purpose behind self-injuring behavior and communicate how alternative coping strategies can be introduced in therapy to help clients manage triggering situations without engaging in self-harm. 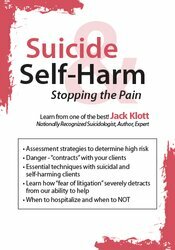 Jack Klott, MSSA, LCSW, CSWW, Suicidologist, and national speaker has helped and educated tens of thousands in his 45 years of suicide and self-harm client work. Jack is a 35-year member of the American Association of Suicidology and was a founder of the Michigan Association of Suicidology (where he has been recognized for his contribution to suicide prevention in Michigan). He authored the national best-sellers The Suicide and Homicide Risk Assessment and Prevention Treatment Planner (Wiley, 2004), The Co-Occurring Disorders Treatment Planner (Wiley, 2006), and Suicide and Psychological Pain: Prevention That Works (PESI, 2012). He is a popular and sought after seminar speaker on suicide prevention, motivational interviewing, co-occurring disorders and the DSM®. Attendees rave about his unique teaching gift of weaving expertise, passion and compassion into practical, understandable and usable information. Financial: Jack Klott receives royalties as an author for PESI Publishing & Media and Wiley & Son Publishing. He receives a speaking honorarium from PESI, Inc. Non-financial: Jack Klott is a member of the American Association of Suicidology; and the Michigan Association for Suicide Prevention. *Please note this is the same content as Suicide & Self-Harm: Stopping the Pain, you cannot receive self-study credit for this program if you have already attended the live activity. PESI, Inc. designates this self-study activity for a maximum of 6.0 AMA PRA Category 1 Credit(s)™. This activity was originally recorded on 09/26/2018. It was last reviewed on 11/21/2017 and is valid until 11/21/2020.